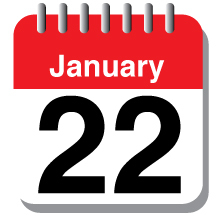 Just a reminder that the last day to turn in ANY WORK for First Semester in all classes is Friday, January 22nd by 5:00pm. Grades are due the following week, so I must set this deadline to give time for grading (see course info packet). On Friday, January 22nd at 5:00pm, all websites will be disabled for uploading of assignments. Work will not be taken for credit after this deadline!